Nearly sixty years after it was originally published in September 1949 P.C. 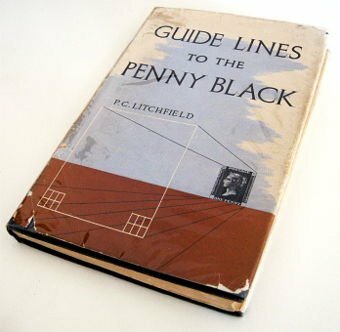 Litchfield's Guide Lines to the Penny Black remains a must have for any stamp collector who is serious about collecting the Penny Black stamp or whose stamp collection centres on early Victorian line engraved issues. Litchfield's lively history and clear explanations of the entire process of creating the world's first stamp from its initial conception and design through to the setting of the soft steel rollers and eventual hardened steel plates and the consequential tell-tale “defects” that this complicated procedure left behind is essential reading for all philatelists regardless of their individual specializations. Undoubtedly Litchfield's greatest contribution to the study of the Penny Black, as the title suggests, is in his guide lines to identifying and plating individual stamps. Starting at check letters AA, then AB, AC etc. working through to TJ, TK and TL, he lists the position of each and every letter and notes all known oddities that may help link the stamp to a particular plate such as the presence or not of ray flaws, “O” flaws, guide lines or double impressions. Illustrated throughout with helpful diagrams, this is a book philatelists of all ages and experiences will turn to again and again.